Hot Standby Routing Protocol or HSRP, is a Cisco proprietary protocol that allows two or more routers to work together to represent a single IP address for a particular network. 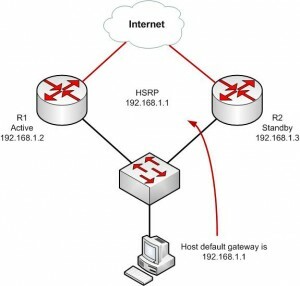 HSRP, as well as Virtual Route Redundancy Protocol (VRRP) are considered high-availability network services that allow for almost immediate fail over to a secondary interface when the primary interface becomes unavailable. HSRP is a fairly simple concept that works by having one router within an HSRP group be selected as the primary or active router. That primary will handle all routing requests while the other routers within the HSRP group simply wait in a standby state. These standby routers remain ready to take on the entire traffic load if the primary router becomes unavailable. In this scenario, HSRP provides high network availability since it routes IP traffic without depending on a single router. To really dig into the Nitty Gritty of HSRP, check out RFC 2281 for full details on the inner workings of this widely used protocol. Before we discuss more advanced HSRP concepts, lets create a basic HSRP configuration to get an idea of how this all works. For this scenario we will use a topology consisting of just two routers. Keep in mind that one or both of these routers could be multilayer switches such as a 6509 or 3750 as well. But for this discussion let’s just refer them as routers. In our scenario above, if R1 fails, R2 will become active. This is perfect! But, if R1 comes back up and returns to service, R2 will continue to stay active. This may not be a preferred behavior. There are times when you may always want R1 to be in an active state in the HSRP group. Cisco provides a way for use to control this by using the Preempt command. Preempt forces a router to be active after recovering from a failure. In this example above, ethernet0on Router 1 is active for standby group 1 and Router 2 is standby. Forethernet1, HSRP group 2, Router 2 is active and Router 1 is standby. This allows us to have each router working for us and forwarding packets to best utilize our investment in our networking equipment. We’ve also added the HSRP group name command to help better describe each HSRP group. This can be a life saver when you have several HSRP groups that you need to track. Do you still have questions about this config or another question about HSRP? Leave a comment below and let’s work on it!